Ali Baba overhearing one of the thieves saying "Open Sesame". 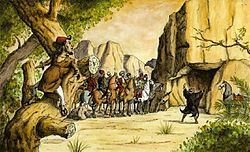 "Open Sesame" (French: Sésame, ouvre-toi) (Arabic: افتح يا سمسم‎) is a magical phrase in the story of "Ali Baba and the Forty Thieves" in One Thousand and One Nights. It opens the mouth of a cave in which forty thieves have hidden a treasure. The phrase first appears in Antoine Galland's Les Mille et une nuits (1704–1717) as Sésame, ouvre-toi (English, "Sesame, open!"). No earlier oral or written version of the story is known in any language. Galland's phrase has been variously translated from the French into English as "Sesame, Open", "Open, Sesame" and "Open, O Simsim". Open Sesame has been classified by Stith Thompson as motif element D1552.2, "Mountain opens to magic formula". In the story, Ali Baba overhears the 40 thieves saying "open sesame". His brother later cannot remember the phrase, and confuses it with the names of other grains (becoming trapped in the magic cave). Sesame seeds grow in a seed pod that splits open when it reaches maturity, and the phrase possibly alludes to unlocking of treasures, although it is not certain that the word "sesame" actually refers to the sesame plant or seed. Sesame is a reduplication of the Hebrew šem 'name', i.e. God or a kabbalistic word representing the Talmudic šem-šamáįm ("shem-shamayim"), 'name of heaven'. Sesame is connected to Babylonian magic practices which used sesame oil. ^ "Les mille et une nuits : contes arabes / traduits par Galland, ornés de gravures". Gallica.bnf.fr. 2009-05-25. Retrieved 2013-08-15. ^ "The Novelist's Magazine - Google Boeken". 1785. Retrieved 2013-08-15. ^ "Sesame: Origin, History, Etymology and Mythology". MDidea.com. 2015-11-30. Retrieved 2018-01-25. ^ "Open Sesame". The New York Times Magazine. 2015-04-08. Retrieved 2018-01-25. ^ Armstrong, Marian (2007). Wildlife and Plants. 16. Marshall Cavendish. p. 972. ISBN 978-0761477105. Retrieved 2014-12-24. ^ Felix Ernst Peiser in Orientalistische Literaturzeitung (1902), as reported in Haupt. ^ Theodor Nöldeke in Zeitschrift für Assyriologie (1914), as reported in Haupt. (in English) Paul Haupt, "Open Sesame" in Beiträge zur assyriologie und semitischen sprachwissenschaft 10:2, 1927, p. 165ff. Originally presented at the meeting of the American Oriental Society, Washington, April 15, 1916. This page was last edited on 24 April 2019, at 01:52 (UTC).